The internet has changed the way businesses are done these days especially the retailing sector has completely changed. 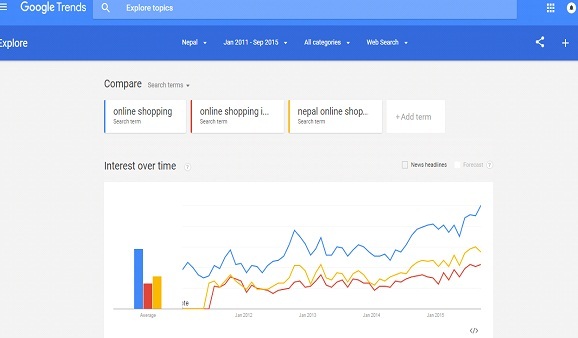 The trend of online shopping has started in economies like Nepal as well. There is emergence of several ecommerce marketplaces that show enough evidence of the importance of the internet and how the concept of online shopping is trending. The different kind of websites that are being introduced makes online shopping in Nepal very easy. Online shopping is a very convenient way to shop because everything that a person wants is available for them and can be bought in seconds with only one click. The time and cost of going out and looking for products is cut down and instead you get everything by sitting at home. These marketplaces give a platform to buyers and sellers where they can easily contact each other and get the desired product bought or sold. Few of the top online shopping platforms in Nepal are Kaymu and Meroshopping. So if you want to buy online in Nepal then there is a wide variety of products being sold online which includes; clothes, footwear, electronics, jewelry, handbags, wallets and even cars! You name a product and you get so many choices to choose from. There are some interesting facts about the shopping trends of Nepal which are stated in a ecommerce report. The report says that almost 72% of the people buying online are male and 28% are females. Ladies you need to start discovering the world of online shopping and make your shopping experience even better and convenient. Also what happened to the concept of shop till you drop ladies? Step up and get whatever you want and avail those amazing price deals. 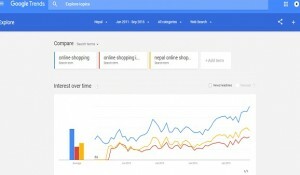 Google trends also show that trend of online shopping in Nepal is getting popular day by day. Another interesting fact according to the report is that even though people have started buying online but the highest number of buyers or the highest number of purchases are on Tuesdays which is fascinating because Tuesday is right after Monday and Monday is when most people have Monday blues so I guess in order to get over their Monday blues, people job. Great idea guys! All in all online shopping is trend that is gaining a lot of popularity and will continue to grow even more. Pick your favorite website and start shopping for your favorite products just by sitting at home and having to choice from such a wide ranging variety.